36,000 premium quality trees in production for the wholesale market. Our mission is to provide the highest quality tree in the best condition to our customers. The crown for shape and uniformity. The leaves for typical size, color and appearance for the stage of growth of the tree. The shoot growth of the branches so that they are typical with the age and size of the tree with no serious branch injuries. The trunk for straightness and no wounds (except pruning cuts), signs of boring insects, lesions and girdling ties. 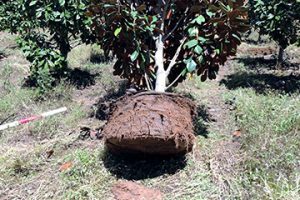 The root system is free of insects and root distribution is uniform throughout the soil mix and growth is as expected for species/cultivar. 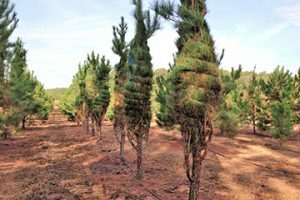 We invite you to visit Lassiter Tree farm and view our trees. Just give us a call so we can schedule a tour. 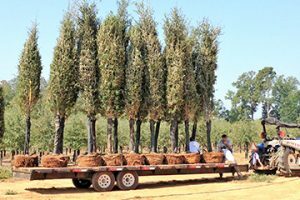 Our Live Oak and Baldcypress (caliper 3″ – 6″) are grown in patented High Caliper fabric bags. This allows for a more robust root structure which is more fibrous with significantly less circling of roots. This equals long term quality and greater survivability than those grown in a container. Lassiter Tree Farm has the perfect selection for ranch and lakefront estates as well as for residential and commercial properties. Find out more about grow bags.